Sparse artwork gives little away as to what is on offer from this latest work from Grauraum, letting his music solely do the talking. 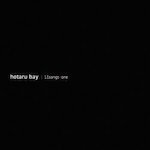 As the opening chiming pads and rich bass drenched beats kick through the speakers with ‘1 of 11 Songs + One’, It’s immediately evident that the listener is in for a treat; with ranging emotional IDM, being Hotaru Bay’s staple ingredient. ‘Dominanzversagen’ focuses the attentions on a darker range of ambient, accompanied by wire-like tinged simplistic rhythms allowing atmospherics to ooze through and dissipate into an aural mist of a driving soundtrack, that melds well into the glitch infused ‘5.24am’. As with a lot of acts from this stable, you can never get away from the underlying influences; and whilst HB pulls on references that occasionally remind me of Gridlock, he does take credit for providing his own take on the genre in competent fashion. Grauraum likes to take the listener on a lengthy journey, letting you pause at key moments in space and time, allowing you to ponder at the vision he is presenting. Hotaru Bay is a good all rounder that gets away with a lot by taking little risk. Nothing is truly original if I am to be fair, but where some albums are a collection of outstanding flashes of brilliance with an array of fillers, HB manages to drive linear clarity from start to finish; that is solid and complimentary to the genre as a whole. Overall, an enjoyable and engaging release that provides an insight into future avenues, where I am sure Hotaru could deliver something truly monumental.